-- Moshe Dayan, 1700 hours, Oct. 7, 1973. There is no such comfortable passage of time in the Arab-Israeli conflict, which sometimes feels like one long campaign, with pauses. We see as much in the newspaper as we do in history books. So it is that ATO #46 is announced at a time when both Israelis and Syrians are at war, but not so much with each other. 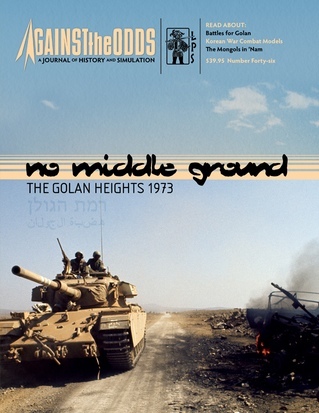 No Middle Ground, by Paul Rohrbaugh, covers the most decisive actions on the northern front of the 1973 Arab-Israeli Conflict. There are three scenarios, from the opening Syrian attack to retake Golan, to the daring Israeli counter-offensive that drove into the heart of Syria and took the war to the doorsteps of Damascus. Plus a Grand Campaign game that covers the entire campaign for the Golan. Each copy of No Middle Ground includes a 22” by 34” map and a full sheet of colorful die-cut counters that represent brigades from the Syrian and Arab Allies’ armed forces and the battalions of the Israeli Defense Force. 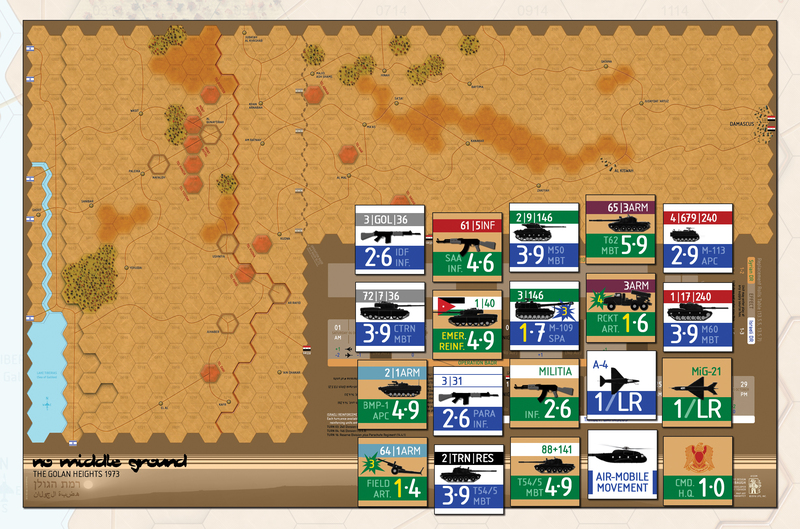 Air units on both sides are potent weapons but must dodge the enemy’s AAA and SAMs. Map hexes are 4 kilometers across and each turn represents 8 hours. Plus a well illustrated rulebook and charts, complete with designer’s notes and historical commentary. Rules for No Middle Ground include, among others, Time-on-Target artillery barrages, Combined-Arms tactics, Improved Positions, Minefields, Airborne and Commando assaults, as well as optional units that could have been deployed by both sides. The interactive, chit-pull formation activation recreates the chaos of battle while still allowing players to deploy and fight their armies. No Middle Ground will test the resolve and skills of game novices and veterans alike.